When you already have a popular crossover vehicle that customer love, it can be pretty difficult to improve it by much. 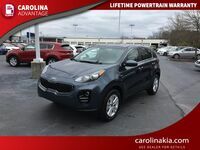 That is exactly what we have with the 2016 Kia Sportage in Greensboro NC. This vehicle has everything that a driver could ask for in a CUV, including an excellent all-wheel drive system for the occasional off-road excursion and excellent bad weather handling. 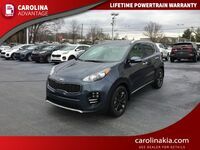 If you want a crossover that can do absolutely anything you ask of it, look no further than the wonderfully designed 2016 Kia Sportage in Greensboro NC. Interested in a 2016 Kia Sportage? Inside of the 2016 Kia Sportage in Greensboro NC, drivers have a wide variety of options to choose from. With a vehicle that is prepared to do anything you ask of it, customers need to decide which features are most important to them. A 4.3-inch touch screen audio display is optional, as is the UVO eServices infotainment system which allows drivers to make phone calls and access apps while driving their 2016 Kia Sportage. 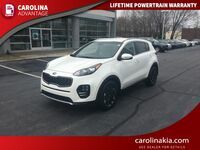 There are plenty of other features available in the 2016 Kia Sportage in Greensboro NC that many drivers are finding more and more convenient these days. The first is a voice-command navigation system with a 7-inch color display to help get you where you need to be. Another is the optional rear-camera display for backup assistance. And one other big one that is available in the 2016 Sportage is leather seats, because who doesn’t like to be comfy? 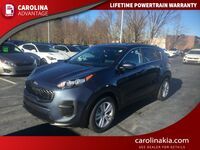 Powering the 2016 Kia Sportage in Greensboro NC are two different engines. The first is the standard 2.4-liter four-cylinder, which is available on the LX and EX trims. This is the fuel-efficient option, getting 28-mpg on the highway and 21-mpg in the city. The second option is the more powerful 2.0-liter turbocharged four-cylinder. This engine produces 260-horsepower and 269 pound-feet of torque which provides smooth, exciting acceleration. 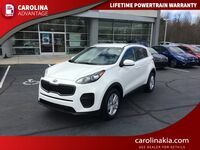 And finally, the most important aspect of the 2016 Kia Sportage in Greensboro NC is the safety that it provides to the drivers and passengers. With dual-front advanced airbags, dual front seat-mounted side airbags, and full-length side curtain airbags, you know that if you are ever in an accident that everyone in the car will be thoroughly protected. In addition, electronic stability control and a traction control system are all working with the driver as well to keep the car safely on the road.